All our orders are shipped via UPS. Expedited (next day air, second day air & three day express ) service is available, but the products we sell are heavy and air shipping can be very expensive. You may check the costs for these services when completing your check out process and compare costs. Should you need expedited shipping, please choose this option when completing your checkout process. Next day, two day and three day options are available at checkout. We currently are not able to ship to post office boxes or APO & FPO addresses and, we are not currently able to ship to any international addresses. 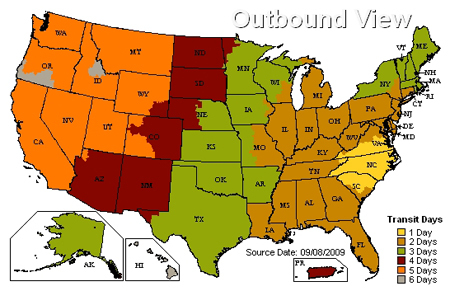 Here is a map that shows shipping time via UPS ground from our North Carolina warehouse.